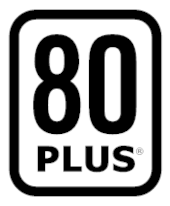 80 Plus (trademarked 80 PLUS) is a voluntary certification program intended to promote efficient energy use in computer power supply units (PSUs). Launched in 2004 by Ecos Consulting, it certifies products that have more than 80% energy efficiency at 20%, 50% and 100% of rated load, and a power factor of 0.9 or greater at 100% load. Such PSUs waste 20% or less electric energy as heat at the specified load levels, reducing electricity use and bills compared to less efficient PSUs. Ecos Consulting (promoter and owner of the brand) and EPRI (Electric Power Research Institute) develop the Generalized Internal Power Supply Efficiency Test Protocol for desktop derived multi-output power supplies. March 2004: the 80 Plus idea was presented as an initiative at the ACEEE Market Transformation Symposium. February 2005: the first market-ready power supply was created by Seasonic. 2006: Energy Star added 80 Plus requirements to their then-upcoming (in effect since July 2007) Energy Star 4.0 computer specifications. November and February 2006: HP and Dell certify their PSUs to the 80 Plus specification. 20 July 2007: Energy Star Computer Specification 4.0 goes into effect. The specification includes 80 Plus power supply efficiency levels for desktop computers. December 2007: over 200 PSUs on the market are 80 Plus certified and it is becoming the market standard. First quarter 2008: standards revised to add Bronze, Silver, and Gold higher efficiency level certifications. October 2009: added specification for Platinum efficiency level. February 2012: Dell and Delta Electronics working together were able to achieve world first 80 Plus Titanium server power supply. Redundancy is typically used in data centers. For the higher certification levels, the requirement of 0.9 or better power factor was extended to apply to 20% and 50% load levels, as well as at 100% load. The Platinum level requires 0.95 or better power factor for servers. The Climate Savers Computing Initiative efficiency level targets for workstations for 2007 through 2011, correspond to the 80 Plus certification levels. From July 2007 through June 2008, basic 80 Plus level (Energy Star 4.0). For the next year target is 80 Plus Bronze level, the following year 80 Plus Silver, then 80 Plus Gold, and finally Platinum. There have been instances where companies claim or imply that their supplies are 80 Plus when they have not been certified, and in some cases do not meet the requirements. When a company resells an OEM power supply under a new name it must be certified under the new name and company, even if the OEM supply is certified. In some instances, a reseller has claimed a higher wattage than the supply can deliver – in which case the reseller's supply would not meet 80 Plus requirements. The 80 Plus web site has a list of all certified supplies, so it is possible to confirm that a supply really meets the requirements. Although some power supply manufacturers name their products with similar names, such as "85 Plus", there is no such official certification or standard. The efficiency of a computer power supply is its output power divided by its input power; the remaining input power is converted into heat. For instance, a 600-watt power supply with 60% efficiency running at full load would draw 1000 W from the mains and would therefore waste 400 W as heat. On the other hand, a 600-watt power supply with 80% efficiency running at full load would draw 750 W from the mains and would therefore waste only 150 W as heat. 80 Plus does not set efficiency targets for very low load. For instance, generation of standby power may still be relatively inefficient, and may not meet requirements of the One Watt Initiative. Testing of 80 Plus power supplies shows that they vary considerably in standby efficiency. Some consume half a watt or less in standby with no load, where others consume several times as much at standby, even though they may meet higher 80 Plus certification requirement levels. Inefficiencies in generating standby power are magnified by the amount of time that computers spend turned off. ↑ "New 80 Plus Platinum Certification". Retrieved 2 October 2010. ↑ "Dell First to Achieve 80 Plus Titanium PSU Energy Efficiency". Retrieved 31 May 2013. 1 2 "80 Plus PSU List". Plug load solutions. Retrieved 31 October 2011. 1 2 Chin, Michael ‘Mike’ (19 March 2008). "80 Plus expands podium for Bronze, Silver & Gold". Silent PC Review. Archived from the original on 10 April 2008. Retrieved 21 April 2008. 1 2 3 "Power Supplies With Fake 80 Plus Badges". Hardware secrets. Retrieved 8 October 2010. ↑ "85 Plus PSU". Hardware secrets. ↑ "FSP Everest 85 Plus 500". Tom’s hardware (review). ↑ Chin, Michael ‘Mike’ (17 November 2006). "Corsair HX520W & HX620W Modular power supplies". Silent PC Review. 1 2 "The Program". 80 Plus. ↑ "Corsair TX650W power supply review". Silent PC Review. ↑ "Enermax Modu82+ 625 Power Supply Review". Silent PC Review. 80 Plus certified power supplies and manufacturers (official Ecova list), Plug load solutions . Can We Trust the 80 Plus Certification?, Hardware Secrets . Power Supplies with Fake 80 Plus Badges, Hardware Secrets .